This revised and updated continual education course represents the best source of information on the 40 Stress Point locations found on any active dog. This unique outline will help you sharpen both your palpation and massage skill and let you "see" with your hands and sense key areas that need special attention. 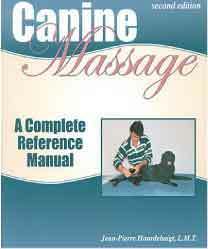 The materials presented here are based on the book "Canine Massage, A Complete Reference Manual, 2d Edition", respectively chapter 8 and 6. Using the "Origin-Insertion Massage Technique", chapter 6, on each of the muscle associated to the existing stress point, you will quickly and efficiently "reset" the dog's musculature. This will provide a general alignment deep in the motor cortex of the brain. It will lead to a better balance of the overall musculoskeletal structures. In addition to your already existing canine massage expertise, this combined knowledge of the 40 Stress Point outline, chapter 8, and the Origin-Insertion massage technique, chapter 6, will help you master the canine sport massage approach for all top athlete in any canine discipline.